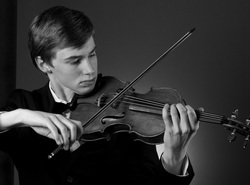 Violinist Kenneth Renshaw, 16, has been concertmaster of the San Francisco Symphony Youth Orchestra since 2008. He made his solo debut at Davies Symphony Hall (San Francisco) performing the Sibelius Violin Concerto in March 2010 with Maestro Donato Cabrera and the SFSYO as winner of the 2009 Concerto Competition. Kenneth’s performance was hailed by the San Francisco Chronicle as “vivid and eloquent…a pure-toned and self assured rendition... virtuoso execution.” Kenneth has also been heard as soloist by audiences in other major concert halls of California including the Walt Disney Concert Hall (Los Angeles), Flint Center, Paramount Theater, and Dean Lesher Center for the Performing Arts. As a concertmaster, he has played under the batons of Michael Tilson Thomas, Sir Simon Rattle, Itzhak Perlman, Donato Cabrera, and Benjamin Shwartz. Kenneth is a scholarship student at the San Francisco Conservatory of Music, Preparatory Division, where he studies the violin with Mr. Li Lin. Kenneth was awarded a scholarship to attend the International Perlman Music Program during the summer of 2009 where he received private violin studies with Itzhak Perlman; he was invited to return for the program’s Winter Residency in December of 2009. Kenneth was selected by the San Francisco Symphony to perform for Yo Yo Ma in a masterclass in January 2010. In addition, he was invited to play for Midori in a masterclass arranged by San Francisco Performances and USC. Kenneth was First Prize winner in the 2009 Los Angeles Philharmonic Competition (Bronislaw Kaper Awards) and was awarded the prestigious national Jack Kent Cooke Young Artist Award by National Public Radio’s “From the Top”. He was featured on this nationally broadcast radio show as soloist in 2008 and was invited to return in the 2010 season as a member of the prize-winning Soleil Trio. Kenneth performed the Mendelssohn Violin Concerto with Symphony Parnassus (San Francisco) in 2010 and the Sibelius Violin Concerto with the California Youth Symphony in 2009. The San Francisco Examiner praised his performance as follows: “securely-grounded technical skills…established his own voice in shaping Mendelssohn’s phrases.” Kenneth was presented in full recital by the Y.E.S. Foundation for the Arts (San Francisco) in 2009, has been a prize-winner in many California State competitions, and performed at the American String Teachers 2010 National Convention. At the age of 8, Kenneth performed at Carnegie Hall as a member of the Villa Sinfonia. He was awarded full scholarships to attend Music at Menlo International Chamber Music Institute in 2007 and 2008. Kenneth has an extensive background performing in masterclasses including those presented by Yo-Yo Ma, Midori, Nadja Solerno-Sonnenberg, Takacs String Quartet, Robert Mann, and members of the Emerson String Quartet.